Comfort. One of the primary benefits of an outdoor kitchen is in the comfort of cooking and dining while enjoying the beauty of your landscape. And, you no longer have to bear with the stuffiness and the pungent smell of fish, meat, and onions that linger in your indoor kitchen. Time- and effort-saving. With outdoor kitchens, you no longer have to go back and forth to your indoor kitchen just to get the necessary ingredients and cooking utensils. Everything is just an arm’s length away. Perfect spot to bond with family and friends. Remember how you used to hurry with your cooking just to bond with friends and loved ones? Now you can join the fun times even as you prepare and cook meals as you will be right where the action is. Basic stand-alone. Also known as a kitchen island, the basic stand-alone can fit even in small areas. The area underneath can also be used for storage. L-shape. You can use the shorter area for cooking and preparing meals while the longer portion can be set up with stools to serve as a dining space. And since it is bigger than the basic stand-alone design, you’ll have enough space for a refrigerator, dishwasher, and other kitchen appliances. U-shape. 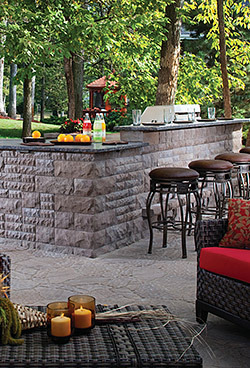 A U-shape outdoor kitchen has it all – a separate area for preparation and storage, cooking, and dining. Of course, you’ll have more area that can be used to hold a freezer and dishwasher, as well as storage cabinets and wine drawers. Split-level. This is highly recommended for those who enjoy entertaining while cooking. Aside from the usual amenities, it also features a bar, dining tables, and other accessories. We at Outdoor Escapes know that you love the Missouri and Kansas outdoors as much as we do. That’s why we strive to do our best to give you what you deserve: beautiful and highly functional outdoor kitchens that you will enjoy and take pride in for a long period of time. 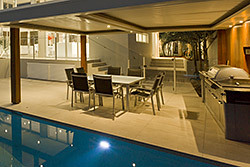 We have mastered all aspects of outdoor kitchen design and layout. 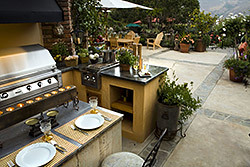 We can also build you customized outdoor kitchens that will cater to your needs and desires. Our teams are composed of licensed and well-trained stonemasons and wood workers. This is one of the reasons why the ICPI has deemed us qualified to be a part of their esteemed association. And when it comes to our materials, rest assured that you will be getting only the best since we partnered with the reputable suppliers in the country like Belgard. We can also provide you with high-grade stainless steel appliances and accessories like refrigerators, freezers, dishwashers, food warmers and cabinets – all designed for maximum strength and durability. Call us now and begin experiencing all of nature’s wonderful bounties through an outdoor kitchen.